ArchiDroid is an awesome custom ROM which brings Android 5.1.1 to the I9300. Download the latest stock rom from samdownloads.de. I my case that is the I9300XXUGNG3 ROM. Reboot into recovery and wipe data/cache. Stock rom should now work. Download ArchiDroid 3.1.5 onto your device. Seit mehr als 1,5 Jahren beschäftige ich mich nun mit Polymer. Web Components sind kommende Web-Standards die das Erstellen komplexer Web-Applikation deutlich bessern. Polymer ermöglicht es diese neuen Technologien schon heute zu nutzen. I just finished and released my first plug-in for Atlassian. Check out the JIRA GitHub Issue Importer. It's a plug-in for JIM (JIRA Importers Plugin) which allows you to import issues from GitHub into JIRA! You can download and install the plug-in from Atlassian Marketplace. Import issues from own repositories, repositories you are a contributor of, and repositories that you have starred. Supports mapping of GitHub labels and mapping of issue states depending on your workflow scheme. Supports JIRA 5 and greater. Are you looking for an easy way to access Linux desktop applications (for Gnome, KDE, ...) remotely? The fernapp software makes it possible to run a GUI application on a headless server and access it from anywhere via web browser! The current implementation of the web browser client is using a Java applet. A HTML5 client will be developed in the future. A prototype iPad app has also already been implemented. I initially developed this software as a part of my master's thesis, which eventually evolved into the start-up fernapp.com. The fernapp software has now been open sourced under the GPL license. Wouldn't it be nice if you could run applications like OpenOffice in the cloud and access them from anywhere? During the past six month I've created a software solution to access native applications that are running on a remote host. 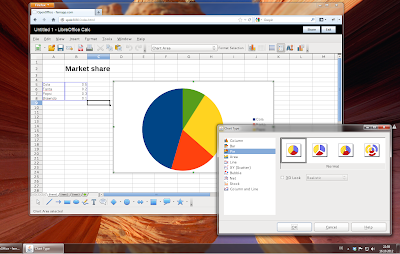 This demonstration shows a Windows desktop and the windows of OpenOffice. The application is not running on the same local machine, but on a virtual machine in Amazon's Compute Cloud. The user agent running on the Windows machine seamlessly integrates the remote windows to make it feel as if the application was installed locally. Elements like pop-up, menus and tool-tips are all treated as individual windows. They can extend beyond the borders of the window they belong to (go to position 01:02). Remote windows can be moved and positioned arbitrarily and independent of the real application running in the virtual machine, which is a big advantage over traditional remote desktop solutions. Considering that it is the first version of the system, it already shows a decent performance. The window content's are currently compressed using H264. There are still many features missing and I didn't do any optimization yet. For instance, there is a lot of potential to decrease the latency further. I believe in the last few hours I have been through all possible variations of the dreaded UnsatisfiedLinkError. I build a native library and wanted to integrate it using JNI. This is an easy one. Just set the path of the library in the java.library.path system property and don't add a „lib“ prefix or „.dll“ / „.so“ suffix in the System.loadLibrary call. This one is a bit trickier. Unfortunately Java doesn't tell what is missing. On Windows use a tool like Dependency Walker to identify what is missing. I also had to load all the dependent libraries with System.loadLibrary calls (in correct order) before loading my own library. You're likely to hit another problem if you're on Window and build a DLL with Eclipse CDT / Cygwin / minGW. If your code tries to call a native method you get yet another UnsatisfiedLinkError with the name of the native method as the error message. It means that this JNI function was not found in the native library. You have to use the GCC linker flag „-Wl,--kill-at“ to build the DLL in a JNI conform way. On Linux make sure that you have compiled the library with the -fPIC flag.